Bogota nightlife now rivals the nocturnal scenes in the likes of Medellin and Cali. The city suffers slightly from the cold weather in that parties don't spill out onto the street in the way they do on the coast for example. 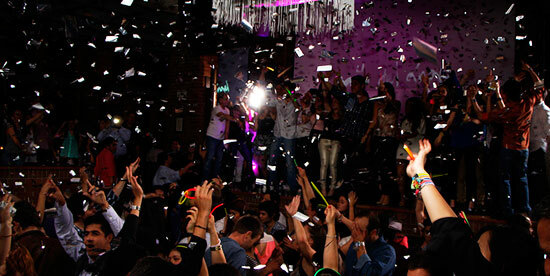 But there is a growing range of nightlife venues, particularly in the form of European-style pubs and clubs. La Zona Rosa stretches for several blocks centred around Calle 82 with Carrera 13 and contains an ever-increasing number of trendy bars and restaurants. If you have a large wad of pesos and a desire to be seen with the 'in-crowd' this is the place for you! There are a number of British/Irish style pubs serving decent beer including the dark, bitter stuff (lovely!). Bogota Beer Company (known in ex-pat circles as the BBC) is the most well known with various locations around the north and also centre of the city, but similar places are constantly popping up. As the name suggests, Parque de la 93 is a park at the junction of Calle 93A and between Carreras 11A and 13, which rivals La Zona Rosa in terms of variety of establishments, cost and flashiness. The park in the centre of all the merriment is attractive and frequently decorated with various lights and other bits and pieces dangled from its trees. The establishments around 'La 93' are probably a bit more aimed at diners and an older clientele, but there are bars that offer something a bit more lively. Usaquen is a great place to go in the evening for a quiet meal or drink. You will find a lot of quality restaurants in this area as well as some nice cosy pubs. Usaquen is likely to be a little more out of the way, but is worth the trip and can actually feel like you've left the city for a small picturesque town. It's a quaint, romantic place and so perfect for a date or dinner with your other half. La Candelaria is also great for Bogota nightlife, especially if you're looking for something a bit more studenty or bohemian. There are some good places around the intersection of Carrera 4 with Calle 15, near Parque de los Periodistas which the Transmilenio crosses on its way up to the Las Aguas station. 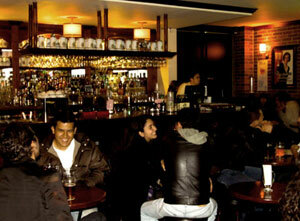 My personal recommendation is Cafe Escobar Rosas which contains a cozy basement popular with students. For further information on attractions etc check out my main Bogota guide.